Collagen is one of the many words that is on everyone’s lips at this very moment and the main reason for this is because there are a huge range of supplements out there that contain it. That brings around the question, does collagen actually work? Does it really boost your skin? Anyway, I’m 28 years old and at the moment, my collagen skin levels are remotely okay. Apparently, things start to go downhill when you get to the age of 25 but even so, I thought it would still be interesting to see what happens as well as finding out if there is anything you can do to actually stop that from taking place. I did a 30-day trial of a product called Skinade and it is actually a collagen drink. This drink claims to work from the inside out. It rebuilds your skin collagen and it also helps to boost your hydration levels as well. When you take a look at everything, you’ll also find that it reduces the effects of fine lines and even wrinkles on top of all that. When you take a look inside the drink, you will actually find that the collagen is sourced right from fresh water fish so this isn’t good if you are a vegetarian. So the drinks had no negative impact on my life. I could take them and they didn’t feel like chores but I did have to set an alarm just so I didn’t forget. Of course, it is best that it is drunk after you have had breakfast so I kept that in mind as well. I honestly thought that they would taste vile but they aren’t too bad at all. There is a peachy flavour and this does smell worse than it actually tastes, but with each bottle containing 7000mg of collagen, you can’t really complain. On top of that, all of that is equivalent to 20 pills, and nobody wants to go ahead and do that. So I wanted to find out if this actually had any effect on my skin so I went to the clinic, which is just inside the area of South Kensington. I had a lot of skin readings done 30 days before the trial and I’ll be honest, I didn’t see any physical differences. I was told however, that I looked good without makeup. Anyway, the readings say differently. They said that my hydration levels had been boosted by over 30.5% and that the thickness of my skin had been boosted by 3.5%. My skin looks thicker and that the yellow blobs are a lot denser. I also noticed that my hair got thicker as well. I have quite strong nails as it is but if they were weaker then I strongly imagine that I would see a difference in that as well. So all in all, I would highly recommend you giving Skinade a go if you would like to start having skin that is plumper as well as skin that is more hydrated with a lot less lines and wrinkles. You can get this stuff online and you can order 30 days at a time with the supply so you won’t have any issues there. Why don’t you give it a go for yourself today to see if you could benefit? It really has never been easier and you could start seeing results in your own skin in a matter of days so you won’t have any issues there. 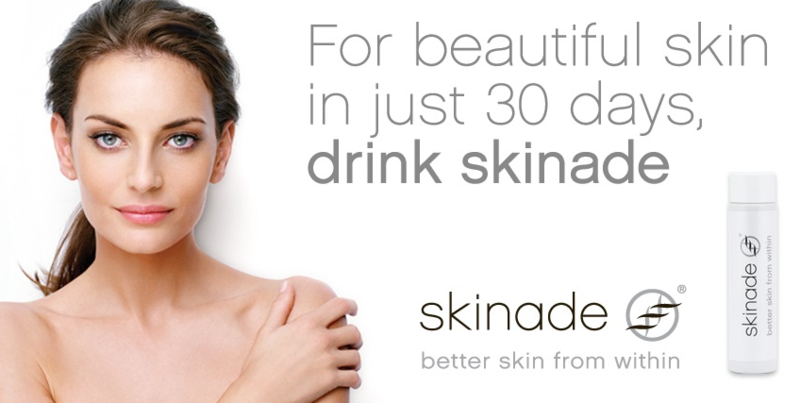 Where To Buy Skinade Collagen Drink? If you would like to give Skinade Collagen Drink a try, you can buy directly from Skinade website here.